Utah Farmers Step Up to Defend Monument Reductions | RANGEfire! SALT LAKE CITY — The Utah Farm Bureau, joined by the American Farm Bureau Federation, is seeking to intervene in a lawsuit against the Trump administration, arguing the U.S. president acted correctly to shrink the boundaries of the Grand Staircase-Escalante National Monument. “Grazing allotments in the monuments are not just land, they are the linchpin of the Western ranching community. The Farm Bureaus’ member ranching families manage the natural resources on these lands for both their livelihood and wildlife,” the document filed Thursday said. The farming organizations have also joined Utah and the federal government in asking the lawsuit by The Wilderness Society against the Trump administration be moved from federal court in Washington, D.C., to Utah. The filing cites the case of Dell LeFevre, owner of the 7 Bar X Ranch in Garfield and Kane counties and a rancher in the area since the early 1970s who has relied on federal grazing allotments. He and other ranchers have seen their livelihoods diminished, the case states. A statement by the farming organizations say while more than 90 percent of the Grand Staircase monument was “open to grazing” on paper, grazing was virtually impossible as a practical matter because of management policies specific to national monuments. Much of the land’s ability to support grazing, for example, was eliminated because ranchers weren’t allowed to implement rangeland improvements. 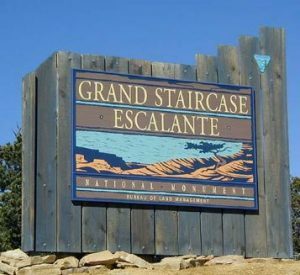 The farm bureau argues that ranchers in established monuments, such as the Grand Staircase-Escalante, have been limited in their ability to manage vegetation to ensure ample forage, utilize fences and corrals for their livestock, and provide clean water for their livestock.